Michael Eric Dyson has 2 media appearances. Michael Eric Dyson discusses Holler If You Hear Me: Searching for Tupac Shakur. Michael Eric Dyson , Can You Hear Me Now? 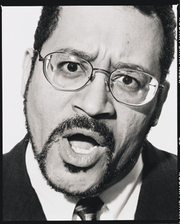 : The Inspiration, Wisdom, and Insight of Michael Eric Dyson. Michael Eric Dyson reads from April 4, 1968: Martin Luther King Jr.'s Death and How It Changed America. Harvard Book Store and the W. E. B. Du Bois Institute for African and African American Research are honored to present Georgetown University sociology professor MICHAEL ERIC DYSON as he examines the death of one of the twentieth-century's great leaders and its impact on the United States. Michael Eric Dyson is currently considered a "single author." If one or more works are by a distinct, homonymous authors, go ahead and split the author. Michael Eric Dyson is composed of 4 names. You can examine and separate out names.